Microbial biofilms represent an important determinant of human chronic infections. Bacterial biofilms involve a genetically-coordinated sequence of events, including initial surface attachment, microcolony formation and community expansion. This leads to a complex and structured architecture protecting bacteria from host-defense mechanisms and killing by antimicrobials. Among the most clinically significant bacterial pathogens is S. aureus, a leading cause of bone and foreign body infections. Despite high incidence and significant morbidity, the molecular pathogenesis of chronic staphylococcal infections and contribution of biofilm production remain largely unknown. 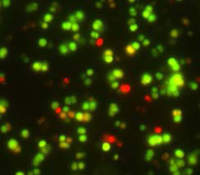 Green Fluorescent Protein expressing S. aureus strain shown by 3-D reconstruction of a confocal image after several hours of biofilm growth (courtesy of Dr S. Clement). Our research focuses on the genetic regulation of biofilm development using genome-wide S. aureus microarray profiling that has been recently implemented in our laboratory. genetically validating the most promising targets by standard inactivation and complementation strategies. Improved knowledge of the genetic basis of bacterial biofilms should lead to novel screening assays, identification of new drug targets, and development of advanced biomedical devices to prevent biofilm formation. Most S. aureus clinical isolates show the capacity to adhere to abiotic surfaces and to develop biofilms. Since S. aureus growing in biofilm is highly refractory to treatment, inhibition of biofilm formation represents a major therapeutic objective. S. aureus biofilm formation implies adhesion to a surface visible through fluorescent microscopy which, combined with live/dead staining, allows counting proportion of live and dead S. aureus bacteria and comparing different strains and/or different surfaces. The biofilm is associated with the production of an extracellular matrix. 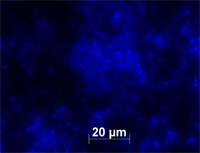 The main constituent of the sugar-based matrix of S. aureus biofilm is called the polysaccharide intercellular adhesin (PIA), indirectly visible through immuno-fluorescent microscopy with a labeled antibody directed against the alpha-PIA. The PIA is produced after the induction of the ica operon. 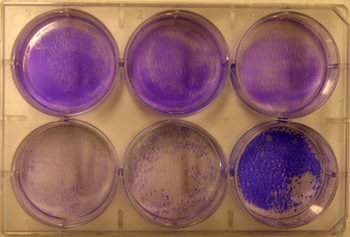 Crystal violet staining allows quantifying the production of biofilm and comparing different strains and/or different conditions. 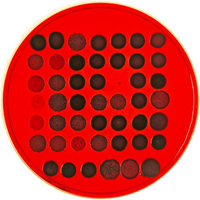 Plating bacterial spots onto a Congo red agar plate allows the genetic screening of biofilm phenotypes, according to the spot appearance.